Ukrainian film director Oleh Sentsov will play the same role in the history of Russia as academician Andrei Sakharov played in the history of the USSR, Ukrainian Foreign Minister Pavlo Klimkin has said. "Russia hoped to deemphasize the story and dampen emotions at the end of his hunger strike. But the story got even bigger. 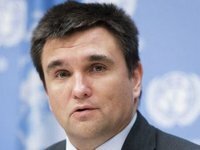 First Senstov received a Polish award and now the 2018 Sakharov Prize," Klimkin said on Facebook on Thursday. As earlier reported, Sentsov on Thursday was awarded the prize of the European Parliament named after Andrei Sakharov for freedom of thought. He was nominated for a prize by a group from the European People's Party in the European Parliament. The Sakharov Prize has been awarded since 1988 by the European Parliament to individuals and organizations that protect human rights and fundamental freedoms. In 2017, the Democratic Opposition of Venezuela won the Sakharov Prize.